Increasing clouds, highs in the 50s. Saturday night: Mostly cloudy, lows in the 30s and 40s. 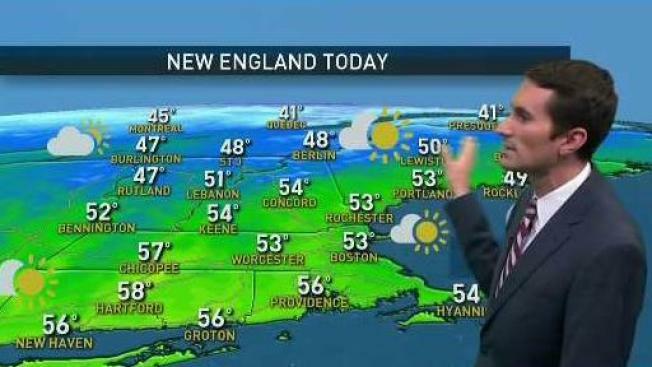 It feels like fall again across New England, at least for a couple of days. Cooler air flowing in from Canada will keep high temperatures in the 40s and 50s across New England on Saturday, with dim sunshine overhead. Clouds will increase and thicken late in the day, and especially at night. Between the building, clouds keep an eye out for this month’s full "beaver" moon. This is usually the time of year beavers prepare for winter, giving the moon its name. Also be sure to set your clocks back one hour tonight at 2 a.m. This is also a good opportunity to check the batteries in both your smoke and carbon monoxide detectors. Due to the time change sunrise will be earlier tomorrow, around 6:20 a.m for many. Sunset will come earlier, around 4:30 p.m. Skies will stay mostly cloudy on Sunday, but there will be lots of dry hours. A few spotty showers will move through from time to time, with the steadiest showers in Northern New England. A few wet flakes may mix in there, but that wouldn’t last long since the showers mark warmer air trying to move back in. Highs will reach the 50s and low 60s. By Monday the wind is gusty out of the southwest and highs pop into the 60s and 70s again. A cold front will drop through New England during the day, bringing a line of showers and downpours with it. The rain arrives during the morning north and during the afternoon south. Cool sunshine returns on Election Day, continuing right into the middle and end of next week when highs will likely stay locked in the 30s and 40s.